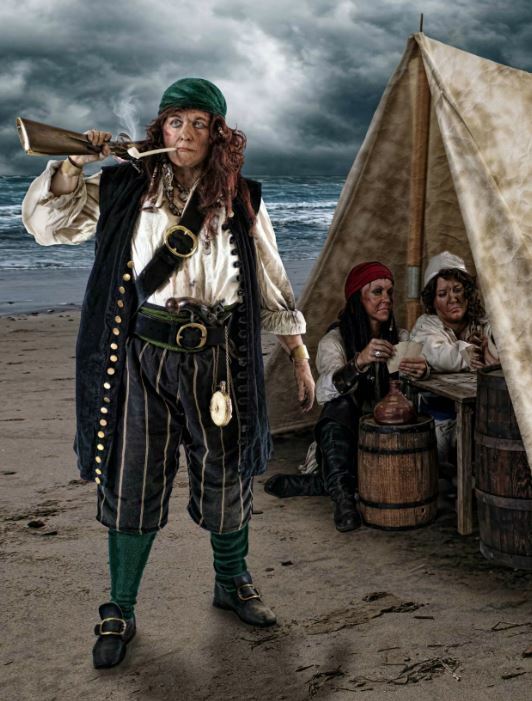 We know historically very few women were actual pirates, sailing the high seas with cutthroat scalawags. 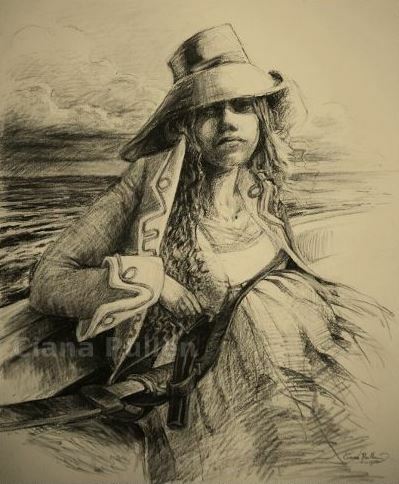 The two most notorious female pirates were Ann Boony and Mary read. While there may have been others that failed to make history, these female pirates would not resemble a wench, a tavern maid, or a harlot. They would have been rough, tough, women dressed to work aboard a ship and blend in with the crew. They would have been equals amongst the men and they would have been required to pulled there weight as such. These women were sailors, adept with tools of the sweet trade, and had no mercy. 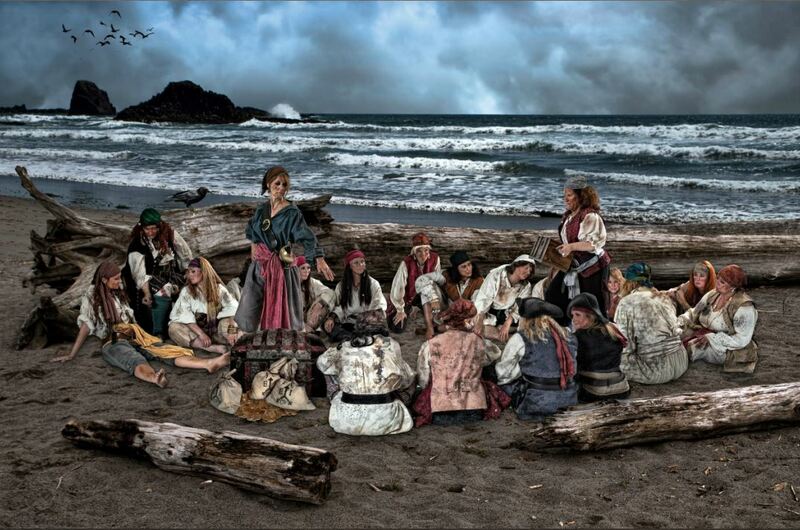 Today the women of the pirate community are most commonly thought of as " wenches" dressed in a skirt and corset. 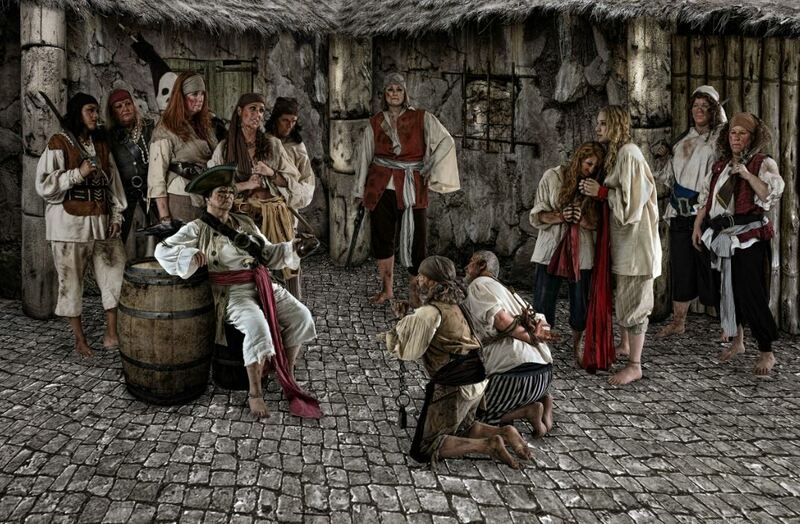 As beautiful as these fine women may be, a wench would have never made it aboard a ship and thus we turn our focus on the females in the community today who are reenacting the golden age of piracy. 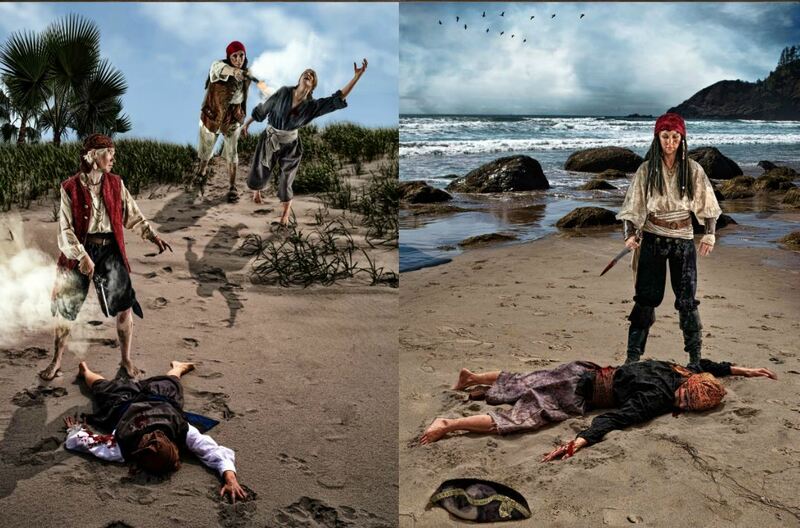 For inspiration we used Howard Pyle's Iconic Pirate imagery. We wanted 10 pix for the layout, and put together a list of Final Images that we would be shooting for. And set to work on how many women we need, what wardrobe, what props, what locations.. We sent out the invitations via Facebook to all women who might want to participate in the project. Eighteen women responded from all over the Pacific Northwest, including Canada and made up our cast. And even a few men were USED, and I do mean that in a tongue in cheek manner as you will see them getting the short end of the stick. We had weather issues and no usable beachfront in the Pacific Northwest at the time of the year. We took the shoot indoors using our makeshift Mutiny Magazine "Studio" in a rented space, brought in professional makeup artists, sewed over 100 authentic wardrobe pieces, compiled hundreds of props from all involved. 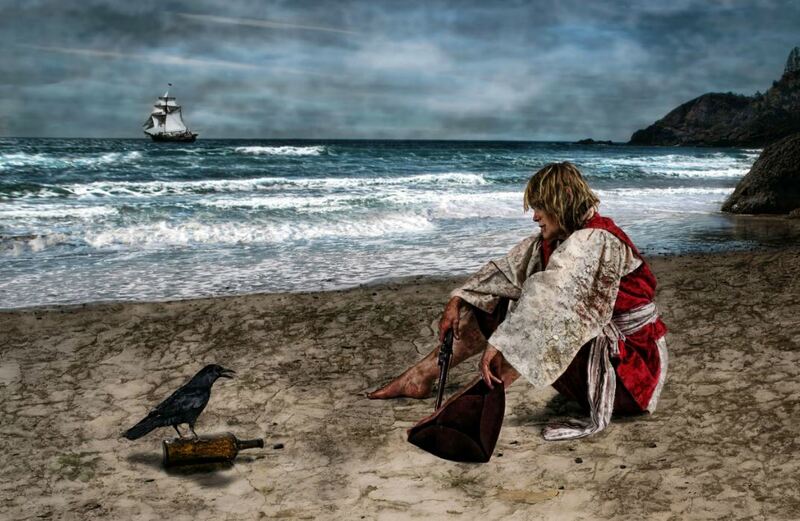 One of the most alluring pirates to cross your path at a Pirate Festival is Rebecca MacKay. She will entice you with her stunning green eyes and sultry smile. 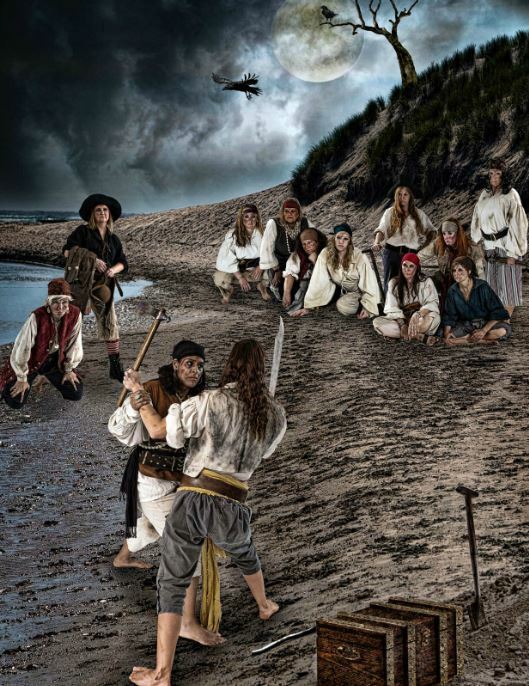 Rebecca is a well known in the pirate community: from pirate reenactment and living history to charities and book readings, to being an entrepreneur & entertainer. She can be found leaving her mark on every facet of the pirate subculture. Rebecca was nominated to the Order of The Leviathan in both 2012 and 2014, and Inducted in 2014. 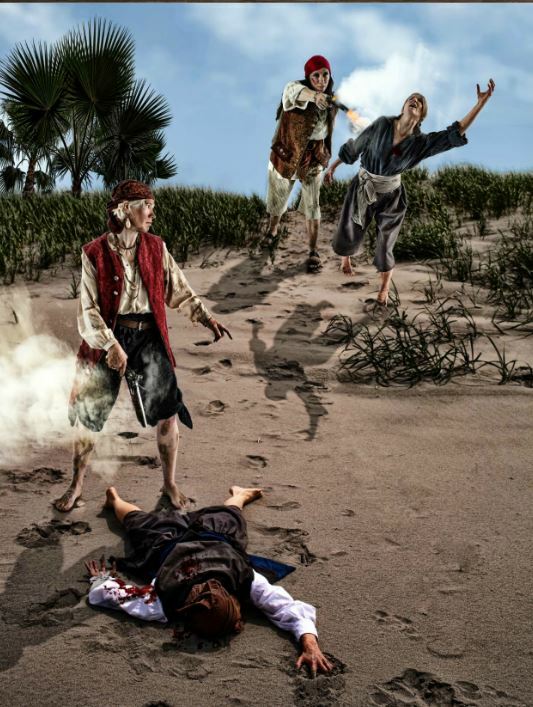 Rebecca travels to exotic locations around the world and educates Pirate Enthusiasts and Lubbers alike on the life of piracy, and to entertain them. She participates in sword fights, ax throwing, black powder shows and cannon battles. Randy Foster is a talented photographer from the Great Northwest. He is a master at the art of photo manipulation and graphic design. 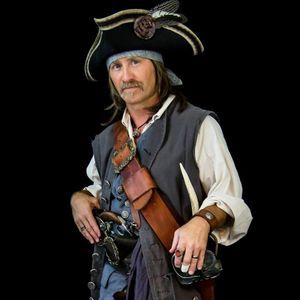 He has become very well known in the pirate & mermaid community as a celebrity photographer. His photos are true works of art, however, his greatest talent is in making his models feel comfortable and relaxed as he captures the most candid and natural poses. Although Randy's photography is in high demand his prices are still affordable and he is easy to reach and ready to photograph at the next opportunity. He is available for individual, group, family & senior portraits, weddings, charities & other events, for fantasy photos and is open to ideas. 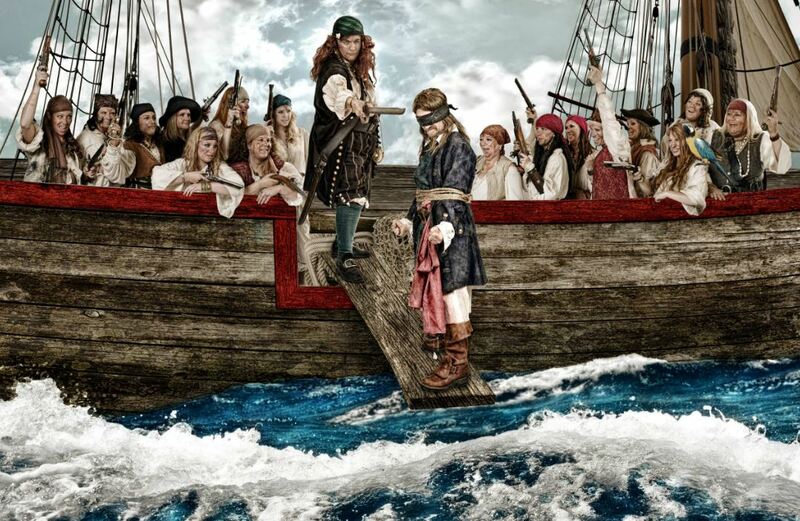 Female Pirates: Sandy Foster, Twisted Maggie Smythe, Nellie Blye, Powder, Amy Whitman, Melissa Trotter, Her Royale Hinie, Erin-Lake-Calvert, Dev Staneart, Thandive Curtis-Gibson, Rebecca Mackay, Krimson Kat, Ginger Garotte, Pheobe Baxter, Kitty Litter, Carol Bisvell, Tess Hunter, Gunpowder Gertie. 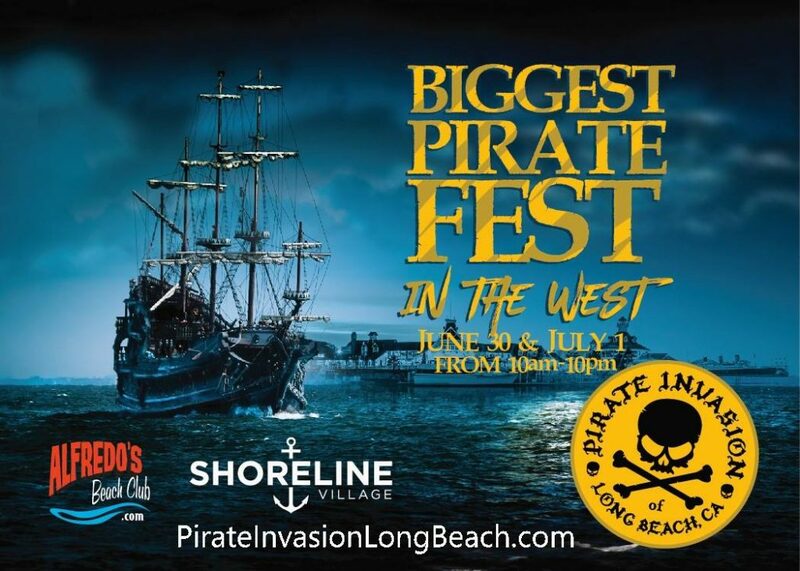 Male Pirates: Scurvy Dog Whitman, Steven Davis, Loose Cannon, Gunwalls, Randy Foster, Jeff Mackay.